Flowering the Easter Cross is a tradition for many during the Easter season. But, before we get into the “how” to make a flowering Easter cross – lets look at the tradition behind this beautiful symbol. The “Flowering of the Easter cross” takes place during Easter. The flowering begins during the Sunrise church service across the country next Sunday. Many worshippers will attend church and participate in the poignant practice of “Flowering of the Easter Cross”. Each worshipper can pick out a fresh flower. This is usually from an assortment of lilies, daisies, tulips, and carnations. Alternatively one may bring a flower from their garden at home. After that, comes the meaningful moment when each individual approaches the cross – often on the lawn or perhaps at the altar. The worshipper stands before the cross to place their flower upon it with reflection and reverence. Often, families stand together at the cross, each picking out a special spot for their flower. 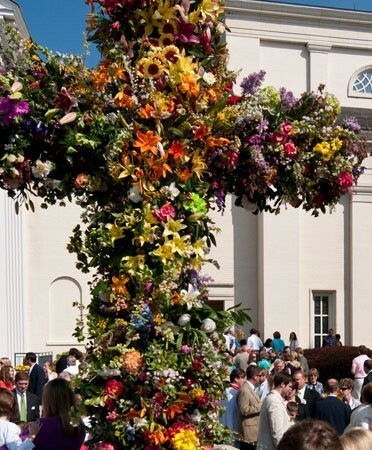 Eventually, the cross is completely covered in beautiful flowers with a brilliant array of color, light, and fragrance. The Flowering of the Easter Cross transforms a symbol of death, darkness, pain, and hopelessness. Above all, the Cross becomes beautiful, new and alive in celebration of the Resurrection of Christ.